A three-month-old chihuahua abandoned in a Las Vegas airport toilet has been taken in by a local animal rescue. Chewy's owner left the puppy at McCarran International Airport on 2 July with a letter explaining she was leaving an abusive partner and could not take the dog on the plane with her. "Hi I'm Chewy," explained the note. "My owner was in an abusive relationship and couldn't afford me to get on the flight. She didn't want to leave me with all her heart but she has no other option." 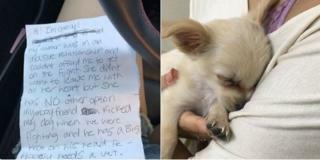 The letter goes on to explain how her partner also hurt Chewy: "My ex-boyfriend kicked my dog when we were fighting and he has a big knot on his head. He probably needs a vet. I love Chewy so much. Please love and take care of him." Chewy was left in a bag in the women's toilet. The lady who found the bag worried it was a suspicious item and contacted security. The canine unit was deployed to inspect the bag but the dogs knew straight away there was a puppy in there. An officer opened up the bag and found Chewy. An employee at the airport brought Chewy to the Connor and Millie's Dog Rescue, a local shelter where he is now being looked after. "We took him to the emergency vet and got him checked out immediately", Darlene Blair, of Connor & Millie's Dog Rescue, told the BBC. "He did have a bump on his head but in 24 hours it was gone. He is fine and healthy and is being well taken care of." Darlene said the shelter had not been contacted by Chewy's owner. "We've had a lot of messages demanding we try to find her. The airport has been bombarded by people saying they need to find this woman. "Chewy is going to be fine and this poor woman is out there somewhere and we don't want to draw her out. We are hoping with all our hearts that she has seen this and knows Chewy is safe and we hope she is safe. "I wish this story would bring more attention to the fact it's a felony to abuse an animal but it's not a felony to abuse a woman." Also speaking to News 3 Las Vegas, Darlene said the incident really got to her. "You could tell by the way the note was written that the woman was in dire stress and she didn't want to give him up and she couldn't take him with her." The shelter has since been inundated with offers of a home for Chewy. "Chewy is safe, healthy and thriving. We have received thousands of applications and inquiries about adopting Chewy and we sincerely appreciate each and every one," the shelter posted on Facebook. "We are hoping that Chewy's mom is in a safe place and will see Chewy's story so we can return Chewy to her if she so chooses and the circumstances are right for both of them. "Chewy is still receiving some medical attention and is not ready for adoption yet. " Although it has gained 1,670 online friends in the past week, the shelter is no longer accepting adoption applications for Chewy. Instead, it urges people to adopt other animals from their local rescue centres and to "tell them Chewy sent ya".